I've been in the mood to make a S'more type dessert but couldn't decide which one to make (I have about 15 starred in my Reader!) With a coworkers birthday around the corner I thought this would be the perfect opportunity, however she's obsessed with Red Velvet Cupcake Pops. I take those in to work A LOT so I wanted to try something different. Noticing Red Velvet Whoopie Pies in my reader I decided to make those and another type of Whoopie Pie. 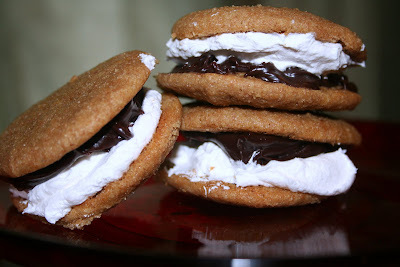 When thinking about it, I realized that a Whoopie Pie is pretty freaking similar to S'mores, so how hard would it be to make a S'more Whoopie Pie?! Well, for awhile I thought my search was futile because everything Google provided me with wasn't what I would consider an actual S'more Whoopie Pie... Until I came across a post on Daily Candy. I noticed that the post was from the day I found it so it was all about timing! You.Must.Make.These... so good! Rich, but since they're small it's not a big deal. Most people don't have Graham Flour in their cupboards, I know I didn't, but it was easy to find and these gems would not have been the same if I tried subbing another flour. Plus, better for you than AP flour, bonus! Directions:Place rack in the center of the oven and preheat to 375°. Line two baking sheets with parchment paper. In a medium bowl, stir together both flours, baking powder, and salt. In the work bowl of a stand mixer fitted with the paddle attachment, beat butter, shortening, and brown sugar until light and creamy, about 3 minutes. Add eggs and buttermilk and beat until combined. In a measuring cup, combine milk, baking soda, and vinegar. Add milk mixture to batter along with flour mixture and beat on low speed until just combined. Add vanilla and beat on medium speed for about 2 minutes, until completely combined. Using a spoon, drop about 1 tablespoon of batter onto one of the baking sheets. Repeat, spacing them at least 2 inches apart. Bake one sheet at a time for about 10 minutes each or until the cakes begin to brown. Remove from the oven and let the cakes cool on the sheet for at least 5 minutes before transferring them to a rack to cool completely. Spread with marshmallow cream and chocolate ganache, but if you’re in a hurry a dollop of Marshmallow Fluff and a square of chocolate will do the job. Directions:In the work bowl of a stand mixer fitted with the paddle attachment, beat together Marshmallow Fluff and shortening, starting on low and increasing to medium speed until the mixture is smooth and fluffy, about 3 minutes. Reduce mixer speed to low, add confectioner’s sugar and vanilla, and beat until incorporated. Increase mixer speed to medium and beat until fluffy, about 3 minutes more. Directions:Put chocolate in a large, heat-proof bowl. Heat cream in a large, heavy saucepan over medium heat just until it bubbles. Pour cream over the chocolate in the bowl and let it sit for about 10 minutes, until the chocolate is melted. Stir until smooth. Allow the mixture to rest until firm enough to spread, about 2 hours. You may also refrigerate the mixture for about 30 minutes, until it is firm enough to spread, stirring every 10 minutes. oh yum!! these look fabulous!